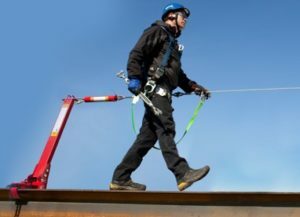 The fall protection certification offered by Trinity Safety meets all the training requirements set out by the Canadian Standards Association CSA and exceeds the requirements set out by Saskatchewan OH&S. The Trinity Safety Fall protection is recognized and accepted by all major Saskatchewan employers including the Co-Op Refinery, K+S, Mosaic, Husky Upgrader and Cameco. We also offer the OSSA (Oil Sands Safety Association) fall protection and the Enform two day rig worker fall protection. The classroom setting for fall protection is very learner friendly, not a bad seat in the room. 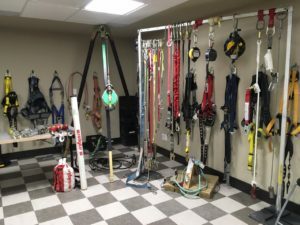 Each student is able to view an extensive display of fall protection gear during the class and the instructor is able to demonstrate use in person as well as on the big screen TV. 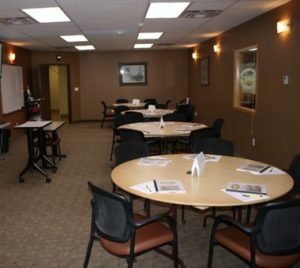 The classroom has ample space for the practical portions of the course like equipment inspections and putting on the harness. The fall protection equipment that students will use and see at Trinity Safety is current, relevant and functional. Participants will use equipment in class that they will see at work and will also see each one of those in a damaged or worn condition and be shown proper and improper connections of each.